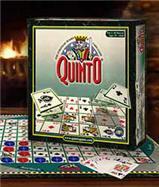 Quinto from the Quinto Game Company, is unrelated to either the Sid Sackson game or the 3M game of the same name. It is, however, and as near as I can tell, nearly identical to the board game Sequence from Jax, with some scoring changes. The use of the word “Sequence” in the page title gives it away, as do the rules provided on the site. This doesn’t stop the site from modestly proclaiming it the best game in the world. They also source a glowing review from Marc Shayed at the (now defunct) Gaming Report.